Air Source Heat Pumps (ASHP) extract 'low quality heat' from the outside air and transfer it into a building as useful heat - often likened to a refrigerator working in reverse. Air Source Heat Pumps use electricity to operate but have a relatively high efficiency. - typically they use between 25 to 33% the electricity used by a normal electric heater to produce the same amount of heat (see below regarding performance). Air to Water - where the heat extracted is used to heat water for use within the building. Air to Air - where the heat extracted is used to heat air for space heating within the building. A means of transferring the heat into the building. The indoor unit consists of a heat exchanger where the heat extracted by the outside unit is transferred to either the domestic hot water system or air for circulating around the property. The efficiency of Air Source Heat Pumps is expressed as the Coefficient of Performance (COP), this is the ratio of the energy at the "output" compared to the energy "input". So if the electricity required to run the fan and compressor is 1 kWh and the heat output is 3.5 kWh, the COP is 3.5. The COP figures quoted by manufacturers is usually given as 'up to'; the COP will vary with the outside air temperature, so day to day and even time of day. it will be higher in with hot air temperatures than cold, so the quoted figure needs to be treated with caution; on a very cold day in winter the COP could fall to 1 (i.e. you get out the same energy equivalent as it takes to run the system). In central UK, a COP could average about 3 to 4 over the year. The average COP figure is important when considering the feasibility of a ASHP - as at May 2011, a typical cost for mains natural gas was 3.150p per kWh, and electricity was 11.52p per unit (or kWh), so electricity was 3.7 times as expensive as gas. So, if mains gas was available, and the average COP for an Air Source Heat Pump was less than 3.7, it would have been cheaper to use gas as the heating fuel. This is a very simplistic example, it doesn't take into account standing charges or installation costs for an Air Source Heat Pump, but it does illustrate the importance of treating the quoted COP figures with caution and considering the costs of fuels available. As at 2011, generally an ASHP is only financially worthwhile in the UK if mains gas is not available; it may be worthwhile if only other fuels (electricity, LPG etc) are available. Typically uses between 25 and 33% of the electricity required for normal electric heating. Few moving parts, the fan and compressor - the mechanical maintenance required is minimal. Although the outdoor heat exchanger and fan need to be kept free of leaves and snow etc to ensure that air is freely circulated over the heat exchanger (mounting the external unit on a wall, as the illustration above, reduces likely blockages). All that is required is an electricity supply, there's no need for LPG or other fuel deliveries. It can heat either water or air for the property. 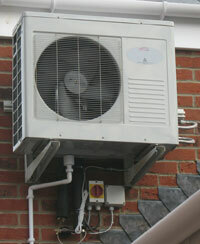 An Air to Air ASHP can be switched so that it will cool the property in summer. When correctly specified, an Air to Water ASHP can provide full central heating and domestic hot water up to 75°C. In theory, they can operate with an external air temperature down to below -10°C, although the efficiency. does reduce as air temperatures drop. Air Source Heat Pumps require electricity for operation so they are not carbon neutral unless some form of renewable electricity generation is used. External space is needed to locate the outside unit. These can be noisy and possibly considered unsightly. The cost of installation is high especially if retro fitted. Generally, ASHP don't work very well with conventional radiator space heating systems, the lower temperature produced by most ASHP are better suited to underfloor heating, so retro fitting may require considerable work. The outdoor unit on some systems may "frost up" when outdoor temperatures drop towards freezing and there is moisture in the air - this would restrict the flow of air through the unit. Some units incorporate a 'defrosting system' which reverses the ASHP to occasionally heat the coil - while this prevents it from freezing up, it does reduce the systems efficiency. As the efficiency of Air Source Heat Pumps falls as the air temperature falls, it may be necessary to have another source of heating to supplement the ASHP in extremely cold temperatures.